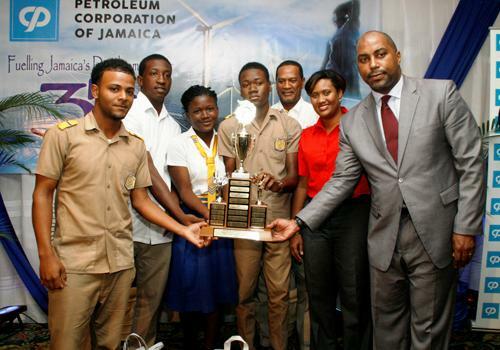 The Petroleum Corporation of Jamaica (PCJ) has awarded cash prizes valued at $1.8 million to the winners of its 2014 Schools Energy Programme Competition. Primary and high school students from 75 institutions across the country participated in the Programme for the 2013-14 School Year. The initiative is the PCJ’s major vehicle for promoting energy education among Jamaica’s youth. The youngsters gained exposure to a variety of energy-related issues including energy efficiency, conservation and alternative energy sources as well as the use of energy efficient products, technologies and practices. In addition, students from participating schools were taken on guided tours of local entities involved in energy production including the Petrojam Refinery in Kingston, the Wigton Windfarm in Manchester and the JPS Hydro Plant in St. Ann. “As the Government Entity with responsibility for public education on energy issues, the PCJ places special emphasis on reaching the nation’s youth,” said Winston Watson, the PCJ’s Acting Group Managing Director. “We have adopted this strategy in order to help our young people to develop an understanding of the challenges our country faces because of high energy costs. This, in turn, should help them to develop lifetime habits and practices that involve energy conservation,” he added. Students from participating schools were invited to submit entries in the PCJ’s essay, science and poster competitions. In each of the categories, entrants were challenged to offer solutions to some of the critical energy issues currently confronting the country’s decision-makers. In the essay competition students had to tackle issues such as the challenges of oil substitution, the benefits and disadvantages of renewable energy sector and the importance of energy literacy. Entrants in the poster competition were asked to apply their artistic abilities to creating designs promoting positive behaviours such conservation, management of energy usage and greater utilisation of energy efficient technology and equipment. The Science Competition was a team based activity which required students to design and build a small scale model of either a home or a small office building that can maintain a comfortable temperature without the use of conventional Air Conditioning. In implementing the Programme for the 2013-14 School Year, the PCJ received significant support from partner organisations including the PetroCaribe Development Fund, Half Moon Resort, Digicel, Conserve It, Sangster’s Book Stores, Allied Insurance Brokers, The Office of Utilities Regulations, the JPS Foundation and Mayberry Investments. “I think it is significant that this year between the PCJ, our subsidiaries and our partners we were able to secure more than $1.8 million in prize money. This is a clear indication that our sponsors and supporters consider this a worthwhile initiative and we thank them wholeheartedly,” Mr. Watson said.